I don’t know about you but when Christmas is in the air, it’s time for my favorite, favorite drink…..
Can you guess what it is? It’s EGGNOG! I love it, in any shape or form and prefer it sans the alcohol….most of the time. I even love the cheap stuff right out of the gallon jug at the supermarket (I know, I know, sometimes I’m desperate) or McDonald’s Eggnog Shakes. My obsession runs deep with this one. However, several years ago I started making my own Chai Eggnog and I’ve never looked back. 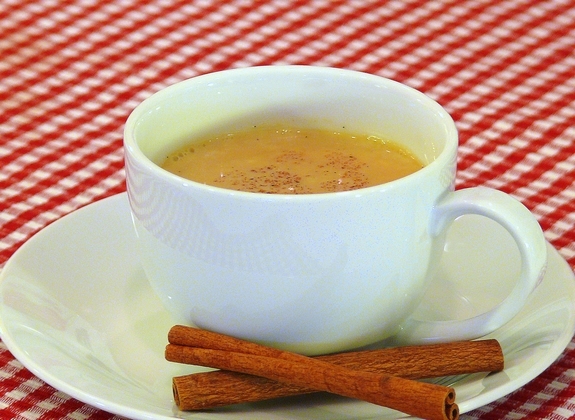 Of course Chai is another obsession, so when you combine the two…oh mercy. This is the perfect warming drink for a cold Sunday morning, what a way to start the day. Here’s what you will need: Fresh ginger, whole cloves, cinnamon sticks, vanilla bean, cardamom seeds, whole coriander seeds, whole black peppercorns, whole fennel seeds, Darjeeling tea bags, eggs, sugar, heavy cream, whole milk. Ingredients not shown: Water and ground nutmeg. With a mortar and pestle crush fresh ginger, 15 whole cloves, 2 cinnamon sticks, 1/2 a vanilla bean, 1/2 teaspoon cardamom seeds, 1/2 teaspoon whole coriander seeds, 1/2 teaspoon whole black peppercorns and 1/2 teaspoon whole fennel seeds until coarsely ground. If you don’t have a mortar and pestle, put the ginger and spices in a resealable plastic bag and crush with a meat mallet. In a small saucepan bring spice mixture and 1 cup water to a simmer. Remove from heat and add 4 Darjeeling tea bags and steep for five minutes. Whisk 4 egg yolks, 3/4 cup sugar and a pinch of table salt together in a saucepan while the tea is steeping. Gradually add 1 cup heavy cream and 1 cup whole milk, whisking until smooth. Cook over medium-low heat, stirring constantly, until mixture is as thick as heavy cream. If you boil this the eggnog will curdle and you will have scrambled eggs in your nog. Off heat, strain the tea into eggnog. Serve in your favorite cup warm or chill until cold. Sprinkle ground or fresh nutmeg on top for garnish. This eggnog is SO worth the effort. You might even forego Starbucks for this one. And for those of you looking to put a little spring in your step, add a Tablespoon (or so) of brandy, rum or whiskey to your nog. If you are serving this warm, add liquor after straining the tea. If you are serving it cold, chill the eggnog and stir in the liquor just before serving. With a mortar and pestle crush fresh ginger, whole cloves, cinnamon sticks, vanilla bean, cardamom seeds, whole coriander seeds, whole black peppercorns and whole fennel seeds until coarsely ground. If you don’t have a mortar and pestle, put the ginger and spices in a resealable plastic bag and crush with a meat mallet. In a small saucepan bring spice mixture and water to a simmer. Remove from heat and add Darjeeling tea bags and steep for five minutes. Whisk egg yolks, sugar and salt together in a saucepan while the tea is steeping. Gradually heavy cream and whole milk, whisking until smooth. Cook over medium-low heat, stirring constantly, until mixture is as thick as heavy cream. If you boil this the eggnog will curdle and you will have scrambled eggs in your nog. Off heat, strain the tea into eggnog. Serve in your favorite cup warm or chill until cold. Sprinkle ground or fresh nutmeg on top for garnish. For those wanting to add liquor, a Tablespoon (or so) of brandy, rum or whiskey will usually be sufficient. If you are serving this warm, add liquor after straining the tea. If you are serving it cold, chill the eggnog and stir in the liquor just before serving. « Where Is He Getting His Information? This is a recipe for me to be excited about. I always have Chai Fraps so why not a delicious eggnog. This is a keeper Cathy!!!! This looks so tasty. I’ll be trying this one for sure. You have combined my 2 favorite drinks. I used to go to Starbucks this time of year to indulge in their Eggnog Latte. No more! I can’t wait to brew this up for all those lovely spicy smells. Thank you, thank you, thank you! Ahhh the holidays …and the things we anticipate eating and drinking while they’re here. Good one Cathy! Wow that certainly puts my eggnog and rum to shame. Love the flavors in this chai egg nog, i am going to make this for my christmas company. That looks delicious, but it looks like a lot of trouble to go to. A splash of rum or whiskey in a regular cup of coffee makes a nice addition though. Hot buttered rum/whiskey coffee is nice, too. It’s the little things that make it all worthwhile, you know. Good morning, and cheers! I love eggnog. Can’t wait to try this. Photos as always really show off so well your efforts, this sounds and looks to good, you want to move yourself forwward to ‘lick’ the screen – or at the very least reach inside your monitor to grab the mug and have a sip…. thanks for sharing yet another wonderful recipe! When I saw the photo of all the hooch, I knew you were thinking of me. Perfect for the season, Cathy. I love eggnog, too, even supermarket stuff. My grandmother was allergic to eggs, so her solution to eggnog was: Soften vanilla ice cream. Add rum. Lots of rum. Stir and serve. You’ve gotta do what you’ve gotta do for eggnog! That eggnog makes me yearn for a nice cup for breakfast this morning. I have some in the carton in the fridge, but that good old homemade eggnog is the best. Your photos are perfect too. Love the cups! I have not had homemade eggnog in years, thanks to Schepp’s dairy. Still, I know homemade is the best. I’ve never been a huge fan of spiked egg nog (must have been the hangover I had from it once), but my family loves it, so I’m going to try this when they come home for Christmas. Thanks! Oh that looks yummy! I make the heavy, alcohol version. No cooking. And the grocery store stuff? Only a quarter of a cup to a cup of skim milk. Just too thick for me. Anytime you bring out the mortar and pestle, you win. Hands down, you win. Perfect drink for cold weather!! And to think, I almost gave my mortar and pestle away. I love eggnog and chai tea and to combine the two, well, lets just say it sounds like a cup of Christmas cheer! I like the idea of cooking the eggs! I’ve seen some raw ones that I cringe at a little. Yours looks very yummy. I saw McD’s advertising the egg nog milkshake the other day and shuddered a little (but I’ve never tried it!) after your endorsement I may have to! Thanks for the recipes…and pictorial enticements! Ok, who wouldn’t love this? 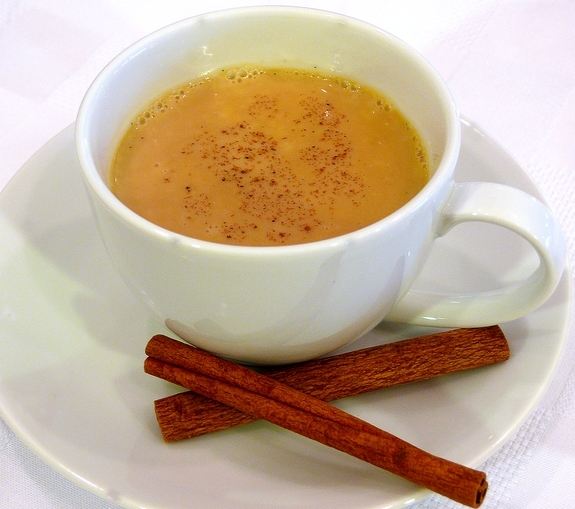 I love eggnog, I love chai tea … I think you’ve just made my day! Oh my gosh Cathy – that looks fantastic! It looks really yummy, but I just can’t bring myself to drink eggnog. Chai + eggnog. What a great idea! My one issue with eggnog is that it’s often too thick and cloying. I usually enjoy it heavily spiked becasue of that. I would wager this probably changes the flavor and structure enough to make it worth trying without th booze. I’ve never had egg nog. I feel so out of touch. Can I please have a cup of this tempting egg nog? It’s one of my very favorite drinks EVER but I’ve never thought to make my own. I love the chai twist to yours. Delicious! Wish I had a cup right now! And with a shot of rum, of course! I’ve never had homemade eggnog, and I’ve certainly never had “fancy” homemade eggnog! I love eggnog too, and yours looks delightful. I’m a sucker for anything Chai. I also like that there’s a bit less cream, so I could drink this and feel 50% less guilt as I guzzled down my portion and my boyfriend’s. Last weekend I tried Candy Cane eggnog – verdict is NOT BAD!!! It looks great but just too much effort for a cup of egg nog unless your young. I’ll take mine with a little snort of whisky please! This is a very nice egg nog recipe, thanks! Oh, that looks sooooooooooooooo gooooood!!! That does it I’m booking a flight. Loved your spread in the Davis magazine. Think I will come see you and just get schnockered. you game? Look at you crushing up your Chai spices. Very cool. Looks great…and kinda like hard work. This sounds warm and comforting. Even though I’m in Hawaii, at work I’m freezing. I often wear a long sleeve sweater plus a fleece jacket! Mmmmmm! I love chai. And I love eggnog. Like you, I love even the grocery store stuff. One year when I was young, our local grocer was offloading his leftover nog for 10 cents a quart. (Yes…it was a long time ago!) My dad bought all he had and froze it. We ate it as ice cream for months. Wonderful! Gotta try this stuff before the season gets much older! I just have to say that I absolutely LOVE LOVE LOVE your site with all these fav recipes and stories…you’re amazing…don’t ever stop!!! I love how you think. We must have the same food cravings. Wouldn’t this flavor be good in some blondies? I wish you and I could have a spiked up eggnog together. Maybe someday when I finally move back to cali. Never been a fan of eggnog but I do like Chai tea. This might be worth trying. Beautiful Post. Good work. I wish the photography on my blog were as good. Do you mind if I ask what camera you use? Oh Yeah,… just what I’ve been looking for. A good drink to get schnockered off of on Christmas Eve. I’m in charge of Christmas Eve this year, and this is gonna be the drink!! 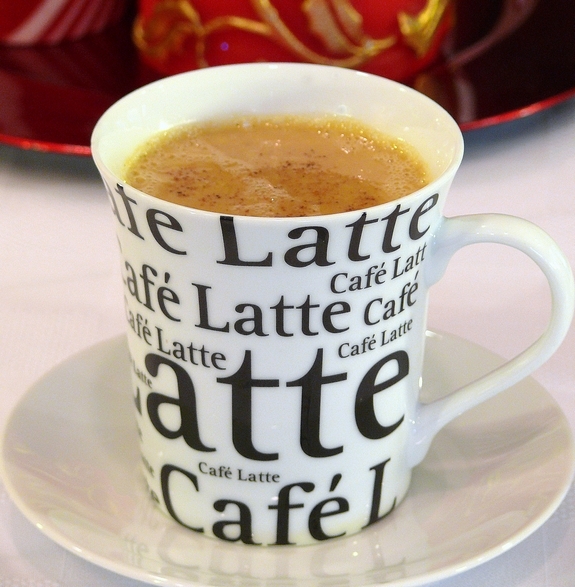 Love, love your chai eggnog! I could use a cup right now. Are you kidding me? Combining Chai and Eggnog…I am officially in paradise! And I have the real chai from India…I can’t wait to surprise the family with this little treat. Great photos as always! Some time before, I needed to buy a building for my corporation but I didn’t have enough cash and could not purchase something. Thank God my sister suggested to try to get the mortgage loans from reliable creditors. Thence, I acted that and used to be satisfied with my sba loan. This looks really tasty – but how many cups/mugs/ounces does it make?